CASSTOWN — The October 2018 Miami East-MVCTC FFA Member of the Month is Paige Pence. She is the daughter of Brent and Christine Pence of New Carlisle. 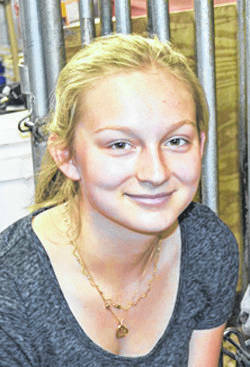 She is a sophomore and second-year member of the Miami East-MVCTC FFA Chapter. Pence has accomplished much in her brief membership in the FFA Chapter. She was the overall winner in the chapter’s Corn Contest for high yields and participated in the Princess For A Day event as a benefit for the March of Dimes. Paige participated in the Farm Safety Week Driver Your Tractor To School Day. Her Supervised Agricultural Experience consists of market goats and market steers. She exhibited the Reserve Champion Market Wether at the 2018 Ohio State Fair. She also exhibited the Reserve Champion Market Beef Animal at the 2018 Miami County Fair. Every month of the school year, the Miami East-MVCTC FFA will select a student to be the FFA Member of the Month. The officer team will nominate one member that has been actively involved in the FFA chapter, school and community activities. If selected, the member will be recognized at the monthly FFA meeting, have their picture displayed in the Miami East Ag Room, and will receive a special accolade in celebration of their accomplishment.